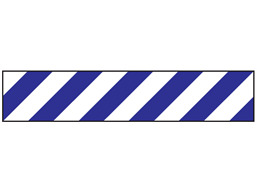 Blue and white striped flagging tape. Non adhesive. High visibility tape for the marking of woodland and the staking of boundaries for surveying, marking of hazards or recreational purposes. Flagging tape. Blue and white striped. Single ply polythene. VTF306 Size 30mm x 50m. Material polythene.